In addition to delivering functional products for general well-being, we also provide technology for sports and athletics. World-class athletes around the world use Phiten products – a testament to their trust in and support of our technologies. 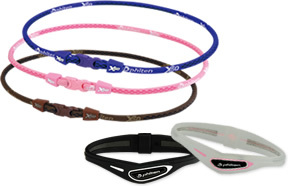 Phiten products incorporate AQUA TITAN and AQUA GOLD to help achieve maximum performance. Such benefits are not limited to the athletic world, but are also available and effective for everyday use. 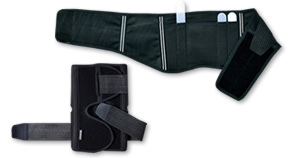 All Phiten products – whether ankle, shoulder or knee supports, apparel, supplements, or simply drinking water, carry with them the power of producing a proper balance in the playing field or in everyday life. We offer products and technologies necessary for healthy and beautiful hair. Promising space for prime sleeping and relaxation. Adhering to “Health” throughout its history, Phiten has developed a great number of technologies supporting customers’ relaxation. With desire for healthy life of all people, Phiten further pursue the technology to create the space generating high quality “relaxation” and comfortable “sleeping”. At “Phiten Room”, AQUA TITAN, Phiten’s unique material leading body for state of relaxation, is permeated into wall surface and ceiling for realizing the creation of the relaxation space for sound body and mind. Simply by wearing these products, your body can feel relaxed and refreshed. Our necklaces are an indispensable item for relieving stress and fatigue in our modern lives. The wide variety of colors and designs brings an element of fun, and is just one of the many reasons for their popularity. In all aspects of life – from everyday activities to athletics – our products can help maximize your potential energy and strength. This is why so many top athletes use Phiten products. 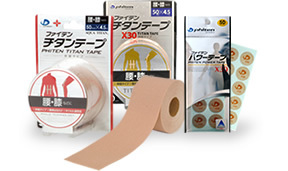 Among the wide variety of products available, Phiten’s titanium tape has long been the favorite of a broad spectrum of customers, from top class athletes to housewives. 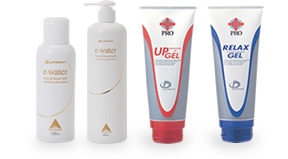 While providing comfort and relaxation as all other Phiten products (such as Phiten Titanium Power Tape and Phiten RAKUWA Necklaces), e-water massage lotion and gel are ideal for those seeking a gentler alternative to Phiten tape. A range of functional clothing with AQUA TITAN permeated into each and every strand of fabric. Our apparel soothes and relaxes the entire body. 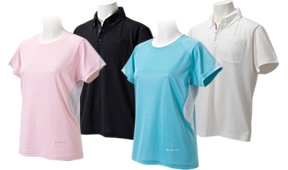 With a broad range of colors and sizes available, everyone in the family can enjoy our relaxing apparel.